German Chancellor Angela Merkel is set to unveil plans to significantly increase deportations of failed asylum seekers. The measures include allowing access to asylum seekers' phones and Sim cards to verify their identities and increasing the amount paid to voluntary returnees. Migration has become a heavily politicised issue in Germany ahead of elections later this year. An asylum seeker killed 12 people at a Berlin Christmas market in December. 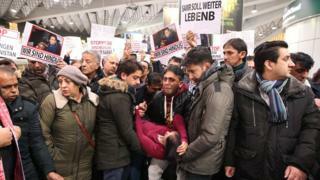 The case of Anis Amri, who Tunisia refused to take back after his asylum bid was rejected, has increased pressure on Mrs Merkel's government. The German chancellor is meeting with state leaders later to discuss a new 16-point plan to speed up deportations. The plan, which was leaked to German media, says that a new deportation co-ordination centre will be set up in Berlin. Berlin truck attack: Can the EU stop another Amri? Exit centres could also be set up near airports to hold rejected asylum seekers in the days or weeks before they are deported. The federal government plans to spend €90m (£76m) this year as part of repatriation and reintegration programmes. More money will be given to voluntary returnees who make their decision quickly. Germany's 16 regional governments are responsible for deporting migrants whose applications for asylum have been rejected. About 890,000 asylum seekers arrived in Germany in 2015. Mrs Merkel's decision to leave the borders open while other European states were closing theirs dented her popularity and led to the rise of anti-immigrant party Alternative for Germany (AfD). But the main threat facing her Christian Democratic Union ahead of September's election are the Social Democrats, which have seen a surge in support since former EU Parliament president Martin Schulz was nominated to lead the party last month. Some state governments led by the Social Democrats oppose the deportation of Afghans who have their asylum claims rejected on the basis that their home country is not safe to return to. Afghans have become Germany's second largest group of asylum seekers, after Syrians, with 154,000 arriving in 2015. Nearly all Syrians receive asylum due to the ongoing civil war in their country. About 25,000 migrants in total were deported last year, while more than double that left voluntarily. More people were being granted asylum, but more were also being rejected, Interior Minister Thomas de Maiziere said on Thursday. "So we have to do more about repatriations and deportations too," he said. Some charities that help asylum seekers have criticised the plans, arguing that wrong decisions are made in the asylum determination process. But Eva Lohse, president of the Association of German Cities, said it was necessary to repatriate rejected asylum seekers "in order to gain the acceptance by residents of those who really need protection from war and persecution". Some 207,000 migrants were facing deportation at the end of 2016, according to government statistics quoted by German press agency DPA. That number could rise to 450,000 people by the end of this year "if the process does not change", Gerd Landsberg of the town and communities association told the Rheinische Post newspaper.